Find your nearest Monarch Dental location to donate now! The affiliated offices of Monarch Dental are joining forces with Community Partners of Dallas to collect backpacks filled with school supplies for needy children across the Dallas/Fort Worth area from now through September 30th. Nearly 170,000 children across Dallas and Fort Worth currently live at or below the poverty line. Monarch Dental aims to make it easier for these kids to get the support they need to succeed in school and in life, whether that means affordable dental and orthodontic care or just basic school supplies. By turning all 51 Monarch Dental Dallas/Fort Worth locations into drop-off points, the company is making it easier than ever for area residents to make a difference. 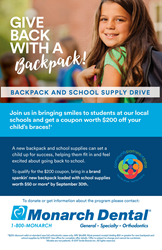 In an effort to encourage even more families to participate this year – Monarch Dental will be providing a $200 discount off braces for anyone who donates a new backpack and school supplies between August 1st-September 30th*. This effort is part of the Community Partners of Dallas annual Back-to-School Drive which aims to collect more than 3,500 backpacks filled with supplies for school-aged children throughout the Dallas/Fort Worth area. To make a student smile this Back-to-School season and earn $200 off orthodontic treatment, bring a new backpack with supplies totaling $50* in value to any Monarch Dental location. For more information and a list of the most needed supplies visit Monarch Dental's blog page.